Clinton County Community Action Board Chairperson Randy Riley advocates that $30,000 of senior services levy funds go to Community Action which provides senior services such as congregate dining, transportation, and wellness and social activities. WILMINGTON — The Community Action board chairperson has made a formal request to the county commissioners for $30,000 of local senior services levy funds rather than the normal $10,000 a year from the county’s General Fund. Over the past two years, Clinton County Community Action has been $42,000 in the red in providing senior services. Community Action, which is a private, not-for-profit organization, has a variety of senior services it operates out of The Wilmington Savings Bank Clinton County Senior Center on North Nelson Avenue in Wilmington. 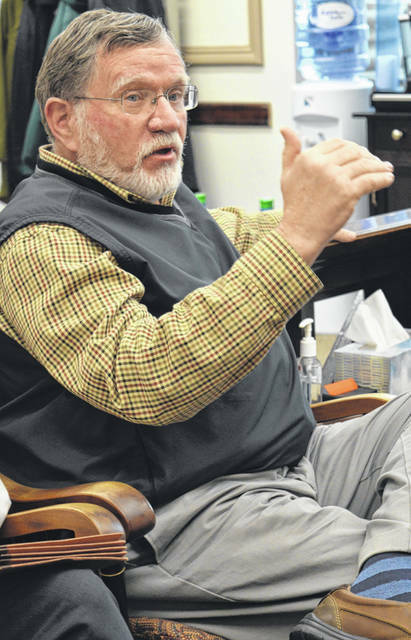 In making the request Wednesday, Clinton County Community Action Board Chairperson Randy Riley advocated the $30,000 come to Community Action instead of to the Council on Aging (COA) of Southwestern Ohio where it would go otherwise. COA of Southwestern Ohio administers the Clinton County Elderly Services Program through a contract with the Clinton County commissioners. That program receives nearly 90 percent of its funding from the 1.5-mills senior services local tax levy, which generates about $1.3 million annually. COA Vice President of Program Operations Ken Wilson attended the commissioners meeting. After the meeting ended, Wilson said how the revenue from the senior services levy is spent is a policy decision by the board of county commissioners. Historically, a purpose of the levy has not been to provide “programming at the senior center. So, that would be a change in policy direction. But that’s their [commissioners’] decision, not mine,” said Wilson. Community Action provides senior services such as congregate dining, transportation, and wellness and social activities. In early December 2018, Community Action Executive Director Dean Knapp told commissioners the number of people having congregate dining meals at the Senior Center on North Nelson has gone up, and likewise requests to utilize Community Action’s seniors transportation program vans have gone up. But on the other side of the ledger, the revenue that used to come from a charitable Bingo operation at Community Action has dried up, and funds from United Way have gone down, said Knapp. He also referred to the popularity of the local senior services levy, which on its most recent time on the ballot garnered 76 percent of the votes. “So people obviously want these services [provided],” said Riley. In late December 2018, Knapp said county commissioners had in the past appropriated $21,000 per year toward Community Action senior services, but that figure later dropped to $10,000 a year.